"La nouvelle innovation Emtel est là"
Innovation is such a tough word and there are hardly any companies here on this island which are really innovative. I mean by definition: innovative - an adjective (of a product, idea, etc.) featuring new methods; advanced and original. And knowing about the technical background of how those MIFI devices actually work, I wouldn't even dare to use that marketing word. Since years it is possible to enable any (okay not all but almost any) decent cellular device to act as an on-demand wireless hot-spot for your WiFi devices. Even some very old Nokia telephones running on Symbian S60 have that capability. Combined with a simultaneous internet connectivity on the same device and some internal package routing we just explained (more or less) the concept of tethering. And de-mystified the magic of those MIFI devices. Eventually, someone might wonder about the legal background of this. Well, luckily Emtel themselves put an article about 'Phone as a Modem' online which clearly describes how to do it via USB or Bluetooth. My conclusion hereby is that tethering is allowed. Spontaneous WiFi access point - Why? Because we can... And because it's just damn cool! Okay, as long as you are on your own it might not be necessary to have a wireless hot-spot in your vehicle but even then there are quite a number of reasons to do it anyways. First of all, any WiFi-only mobile device is instantly able to go online. This might be your Apple iPod or iPad, your Sony PSP or PS Vita, your Nintendo 3DS, or any other Android tablet without an integrated SIM card. Second, sharing the internet connection for multiple devices reduces cost on monthly expenses. Instead of catering for multiple SIM cards and mobile web packages you would only need to have one. And last but not least, did I already mention that it is just cool? My reason to build this system is because I'd like to be able to have more comfort while I'm on the road. The children can fire up Skype and talk to their grandparents, or synchronisation services on our WiFi-only devices are still working. It's also fun to use Apple Maps to get directions here on the island. 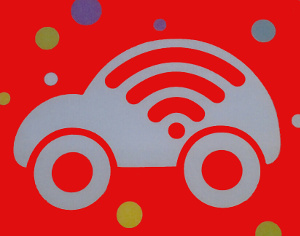 Now, packed with our brief knowledge on how we might be able to achieve our own in-car wifi system with internet access it's time to check our list of required items. When I say any smartphone with tethering support, I really mean it. Even though I personally prefer to use an Android-based smartphone you are not restricted to that I would encourage you to try the same (or at least similar) steps with a Symbian device, any Apple smartphone like the iPhone or even the iPad, or a Blackberry device. Actually, it would be awesome to have your feedback and eventually references to your installations in the comment section at the end of this article. "Hi, I'm currently looking for an 'abandoned' (used) Android phone. Anything with USB charging will work... Brand, model, etc. doesn't matter." And luckily in less than one hour I closed a fair deal for a Samsung Galaxy Gio (GT-S5660). The specs for the device are okay and the Gio seemed to be a commonly used low-budget device with a good set of features. Of course, any other tethering-capable smartphone would do the job, too. An appointment was set for the next morning. Hmpf, what to do while waiting? Well, I did a little bit of research on the device and gathered some information about latest official firmware provided by Samsung and the possibilities to install aftermarket firmware / customised ROMs like CyanogenMod or others onto that device. One of the positive features of the Galaxy Gio is the ability to charge the device via USB cable (even though it has a micro-USB connector). This is good for two particular reasons: First, I already have a set of various USB cables and USB power chargers which simplifies my shopping effort and second, only one standard cable necessary to hook it up on my laptop. The USB charging is also very interesting for the permanent installation in the car. Simply get an USB power charger for the cigarette lighter unit of your car and you're good to go. In my case, I already have one of those in place for my Galaxy Tab 10.1 and my BWE's Galaxy S3. If I remember correctly, I bought my power charger at the phone supply shop at Medine Mews in Port Louis but you should be able to get it anywhere on the island. Just keep an eye on the maximum allowed electric current; usually it's 1 Ampere (1A). Due to the tablet I bought a stronger one with maximum current of 2 Ampere (2A). Due to my professional activities running a software development company I already have multiple subscriptions with Emtel and it happens that one of my SIM cards for data packages is not in use. Otherwise, you might have to go and visit a showroom of Emtel (or Orange) and get one of their web packages. Quick advice: Ask for a SIM card for data package only. This might save you some bucks every month. For my installation I'm going to use an Emtel Postpaid Mobile Internet with monthly 1GB. The monthly bandwidth volume can be adjusted easily via telephone at any time. As expected, the Galaxy Gio was running on an older version of Android, namely Gingerbread 2.3.3, and therefore it was just right to initiate a little flashing session. First, I tried the 'Software Update' feature of Android but Samsung didn't provide any updates - how surprising. Okay, over at SamMobile - Everything for your Samsung Mobile I got a nice list of country specific firmwares. The interesting aspect hereby is that SamMobile provides you only with firmwares that have been officially released by Samsung. All information is from Samsung KIES. Disclaimer: Remember by following the instructions here everything is on your own risk! If you brick your device, don't blame me for it! Originally, I gave the German firmware (S5660DBTKT3) a first shot but then I went for the latest one (S5660OXXKT5) available from Czech Republic. But after all, I'd say that it doesn't make a difference although I noticed that Google Books app isn't there anymore. Which is absolutely okay and saves me valuable memory space. Using the latest official firmware released by Samsung - Android version 2.3.6 - I was eager to check out some features and to run a couple of manual tests. First of all, I had to configure the network parameters for internet access, namely APN (Emtel: web) and connection profile. Everything went smooth and the Gio went online as expected. Then, I checked whether on-demand WiFi hot-spot and tethering was working. After a quick baptism for the ad hoc SSID name and some password arrangements I got my Tab paired successfully with the Gio and I could go online within less than a minute. Next, it was time to update a couple of pre-installed apps like Market, Talk, Voice Search, Maps, etc. to their newer counter-parts and to install some of my all-time favourite Android apps. One of them is for sure AirDroid - Best Device Manager which provides remote access to your Droid device via (wireless) network. I'm still skipping the registration part; mainly because I don't want to enable remote access via internet. As per my research on the previous day, I always came across references towards Tasker. Note: Crafty Apps EU offers a 7-days trial version of Tasker and Starter Guides on their website. You might give it a try before purchasing the paid app from the Play Store. Last but not least, I installed the Voice packages for Gingerbread's text-to-speech engine, SwiftKey Keyboard, Google Maps, and so forth. Of course, not too many apps but just some vital ones for usage in the car. Anyway, after successful installation of all apps it was time to get everything into the car and connected. The USB power charger is already in place since months and therefore I only had to swap the USB cable for the Galaxy Tab against the one for the Galaxy Gio (which is identical to the one for the Galaxy S3...) and plug in all connectors. Car's ignition system on, firing up the USB power supply and the S5660 device indicates 'Charging...' - Nicely done so far. Next, let's activate our pre-configured on-demand hot-spot and establish a data connection via Emtel. Again no problems and thanks to previous pairing and stored WiFi parameters I could surf on my tablet in less than one minute. My very own In-Car WiFi project is running and operational for all passengers. Pretty sleak and it didn't take that much of time or resources after all. Compared to on/off switch on the MIFI device we only have to enable or disable the Mobile AP in the Wireless settings and we are good to go. "Tasker is an application for Android which performs tasks (sets of actions) based on contexts (application, time, date, location, event, gesture) in user-defined profiles or in clickable or timer home screen widgets." Ignoring to read any kind of instructions or starter guides I was able to create, configure and run my first profile in a couple of minutes. The definition itself is very simple: Enable tethering after mobile has been switched on. Okay, let's give it a try... And to quote the IT Crowd: "Have you tried turning it off and on again?" Yes, now it works. Good, let's be a little bit more specific on this first profile: I only want to enable tethering after booting while I'm not at home. Sounds legit, or? Okay, there are actually various possibilities to handle this. First and most obvious, check the GPS location of the device and decide based on the coordinates whether it is necessary to activate the hot-spot or not. But this would also require that GPS location services are active (or enabled) and it takes a bit of time until the position has been located. Due to my experience while playing Ingress this can be nasty from time to time. Well, at home I have another wireless network in use and so I specify that the hot-spot should only be activated in case that the smartphone is not in the immediate vicinity of my home zone. Next, we should take into consideration that the Droid might be switched on while I'm still waiting in the yard. So far, Tasker seems to be flexible enough to handle this already based on the existing conditions. Leaving my place automatically switches the in-car WiFi on - Check! But of course, we would like to have the opposite: Switch off our hot-spot as soon as we are back. We need a new Tasker profile for this which simply disables Mobile AP as soon as we are in the proximity of the wireless network at my premises. Quick and easy, job done. Both profiles complete each other on contrary contexts and actions. And last but least, I'm going to configure two more Tasker profiles. One that puts the mobile into Flight Mode during night hours (let's say between 20:00 hrs and 8:00 hrs), and a second one that is going to send an SMS in case that the battery status falls below 5%. That should be sufficient enough to handle most cases. If not, adjustments can be done easily. Overall, I'm very happy about the total cost spent on this DIY project. Couple of hours fiddling - priceless! Note: The cost of the monthly Mobile Internet access applies in both cases and is excluded on purpose. Depending on your usage profile you might consider pre-paid or different packages. Personal thoughts about events and activities during 2013. Our last monthly meetup for 2013 had been organised at the Ebene Accelerator, Orange Tower, Ebene. Already the pre-registration or commonly known the RSVPs look very promising. At least 17 craftsmen were expected to show up. And... it was better than that.